I stopped wearing deodorant and I was amazed at how I smelled. I no longer wear deodorant. Last year I decided to not use any deodorant and it has been a good thing. Now before you start thinking that I must be super smelly and what was I thinking. Well, I did give up mainstream deodorant but I started using an organic natural deodorant, so technically I did not stop using deodorant. I just gave up the chemicals and other toxic ingredients that are in mainstream deodorant products and decided to take The Deodorant Detox Challenge. Well, I was worried about putting ingredients like aluminum and phthalates onto my underarms. I had learned recently that these toxic ingredients just don’t sit on my skin but are actually absorbed into my body. I recently read that if you rub a garlic clove on the bottom of your foot that in a while you will be able to taste the garlic. What an amazing way to see how your skin absorbs things and how they get into your body. Sponsored post: I receive samples from EO and Treets to facilitate this post. Was I concerned about body odor when using organic deodorant? Well, I was a bit hesitant to give up something that made me smell good and stopped me from sweating. Especially knowing that there could be a transition period (up to 30 days) where body odor can actually increase. I also knew that I was trying to get chemicals out of my life and I had to start making these switches. So I took the plunge and decided to try EO Organic Deodorant. 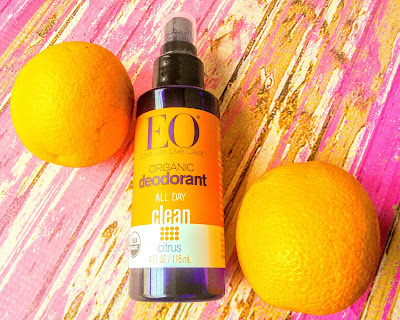 I started my day with the great citrus scent from the organic deodorant on my armpits. I then went out running and did the smell test. I noticed a bit of body odor but also some citrus scent. So I just sprayed for of the awesome scented EO Clean Citrus Deodorant and all was good. Throughout the day I did the smell test, trying hard not to be noticed and just reapplied the citrus spray if needed. On most days of the 30-day Deodorant Detox Challenge, I mostly just reapplied the spray after running and I was fine with that as I was already changing my clothes. As I was two weeks into the challenge, I noticed that I was less stinky after running and did not need to reapply the EO spray, ok a couple times I forgot to. When I did the smell test later in the late, I did not have any body odor. Did you know that the cause of body odor is basically bacteria? When we sweat, the bacteria living on our skin breaks the moisture down into acids and can result in unpleasant odor. It’s important to remember this when choosing your natural deodorant. An ingredient like alcohol, the main ingredient in EO Deodorant Sprays and Wipes, is effective against the main source of body odor: bacteria. So will I continue to use organic deodorant? I sure will continue to use EO Organic Deodorant as it has a nice citrus scent, it also comes in other scents like lavender. I don't mind having to respray the deodorant after running as I am putting fewer chemicals into my body. For now, I have not had the need to reapply later in the day but EO makes these awesome Natural Deodorant Wipes that I can put into my purse to use if needed. I will be taking some of these wipes with me when I go to a fitness conference later this month. Want to know more about The Deodorant Detox Challenge? I found a lot of useful information about switching to organic deodorant at the EO website that helped me to understand the process and it answered a lot of my questions. EO also sells an amazing kit so you can arm yourself with all the supplies that you need to take the challenge. So if you want to stop putting chemicals into your body, then you really must check the website. 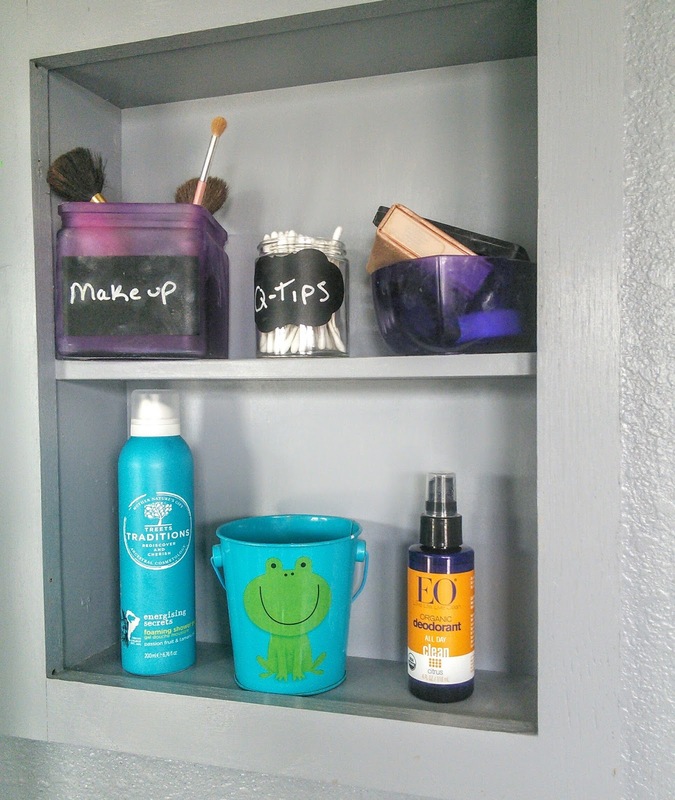 Wondering about that other blue container on my shelf? It is an invigorating scented foaming shower gel and it makes my shower so fun. I just love the way it foams up, my son calls it expanding soap. This shower gel just a great job of moisturizing my skin and I just love the passion fruit scent! This line of products contains natural ingredients too. The Energising Secrets collection was inspired by natural ingredients from the Amazon that invigorate the senses with their fresh and fruity fragrances. Ingredients like Tamanu, Buriti, Passion Fruit, and Sacha Inchi oil are included to help moisturize and protect skin with the same natural ingredients women have been using in the humid Amazon environment for centuries. This collection includes Foaming Shower Gel, Shower Gel, Body Sugar Scrub, Body Cream, Bath Fizzers, Hand Wash, Hand Lotion, and Hand Cream. So will you give up deodorant? This is really interesting to read, I sweat a lot and so it would be good to find a more friendly way to combat the smell really as sweat just happens. Mums always know whats best (usually for her and girls. hehehe) and I don't always argue with certain things. a great collection of toiletries. I will read more about the challenge knowing your experience and decide if it is something I can do. Maybe when it is not so hot and humid I would have better luck. I carry wipes in my purse as well. This cabinet used to have a light wood door on it. I removed the door when we redid the bathroom and it helps keep stuff organized. Can I be honest? I've never worn it. I don't like the way it feels or smells. I don't have a BO problem either though. I've actually heard of DIY homeopathic deodorant using essential oils. I haven't tried organic types of deodorants, but this definitely looks refreshing. I think this would be a great product to try. I am all about trying healthier products and this sounds like it would smell good. Oh man, I DEFINITELY cannot switch to all natural. I wont lie - and this might be TMI but... I can really stink! LOL!!!!! I need to load up on deodorant a few times a day! LMFAO!! A group of friends and I did this a few years ago... even tried making our own deodorant. We actually worked many chemicals out of our lives from body cleaners to household cleaners by switching to Norwex! Love it and won't go back to chemicals in my life. This is perfect timing! Regular deodorants give my husband a rash so we are currently trying to find him a better solution. Thanks for this! I stopped using deodorant every day after the birth of my first child. Luckily I do not sweat all that much, so forgetting to put it on is not a big deal for me. I honestly rarely use deodorant. I don't sweat that much and when I do, it doesn't stink. I got lucky there! I was told once that wearing mens deodorant was better because they don't put the same chemical in it as they do the womens. Or to look for ones without the aluminum. I am pretty picky in what kind of deodorant I wear. Old Spice has always been my favorite. I have worn it for over 20 years after trying several other brands and not liking any of them. I always love natural products because they are not only purify and good for our health but they are also very friendly with the environment :))) I love the smell it bring to me and I definitely use it for a long time. Thanks for your sharing! I changed my usual deodorant to a natural one a couple of months ago and I'm loving it. No harsh chemicals and it still keeps me fresh and it smells amazing too! This is super interesting! I have a friend who always tells me how I need to switch up products but like you were initially I'm often so scared of how this will be impacted by those switches. This post definitely helps give me a bit more insight. I have been tirelessly searching for a great more natural deodorant brand!! This post is really helpful, thank you for writing it! Deodorant alternatives or natural deodorants can be so frustrating. I have bought numerous different brands and found that they just aren't effective. Thanks for this recommendation - I'll be picking some up to try! This is truly a very interesting product and am glad I came across of your review. Thumbs up for switching! Thanks for sharing this informative article. My hubby sweats so I will suggest him to give this alternative a try.